← HRA News – Join us Thurs Sept 28 at 10 am! Time for HandyDART Riders to be seen again! meeting on Thursday September 28, 10am to noon, as a way of reminding the NDP’s election promise to “Fix TransLink” by putting elected officials back in charge. The BC NDP election platform states that the “BC Liberals made a mess of Metro Vancouver’s transportation governance, by undermining the mayors, giving power to Liberal appointees over elected officials [and] passing the buck when convenient.” However, the NDP has not yet given a timeline for fixing TransLink governance. 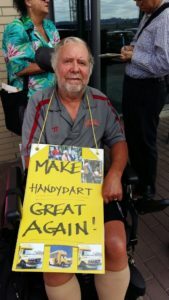 The HandyDART Riders’ Alliance sees the poor quality of HandyDART service associated with contracting out as a human rights violation, and filed a human rights complaint. This complaint was recently accepted by the B.C. Human Rights Tribunal, and mediation is tentatively scheduled for mid-December. TransLink promised a Multiple Accounts Evaluation of bringing HandyDART in house compared to contracting out. However, no Multiple Accounts Evaluation (MAE) report was ever completed. Instead, the TransLink board rubber stamped contracting out without properly considering safety or quality of service. 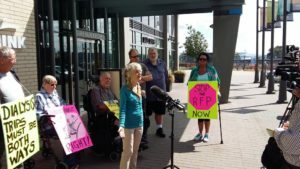 HandyDART Riders Alliance spokespeople will be available for interviews at the TransLink board meeting Thurs Sept 28 10 am to noon at the TransLink Boardroom – 4th floor 287 Nelson’s Court New Westminster, BC.